A friend of mine mentioned to me the other day that she was planning to organize a band competition. It sounded pretty intriguing at the time and I couldn’t help imagining myself with my own band playing along to Fields’ ‘You Brought This On To Yourself’. But, it was just a ridiculous fantasy, what with the fact that I’ve zilch knowledge in playing the guitar or drums or any other musical instruments for that matter. 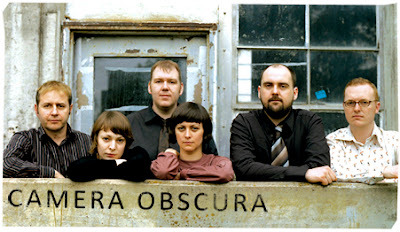 But, if I ever wanted to put up a band together, it would definitely be somewhere along the lines of Camera Obscura. 60s twee pop just screams coolness; retro coolness that never dies with time plus you’ll never run out of reasons to adorn polka dots similar to the 60’s clothing. Not that I’m a huge fan of polka dots unlike someone I know. I’m aware that to some people, liking retro music is un-cool, but there’s just something about retro music that’s so much more relaxing and liberating compared to the songs that’s being played on radios these days. Some of Camera Obscura’s fans would think that I’d do the band some injustice if I write about them based on a single song. But, judging from the song ‘If Looks Could Kill’, I’m definitely more than certain that there’s so much to like about Camera Obscura. A band from Glasgow, Scotland that focuses solely on the genre of twee pop and presents their music crammed with candy filled goodness and infectious melodies.